Focusing on weaknesses prevents failure. Focusing on strengths breeds success. When it comes to professional development, convention tells businesses to focus on our weaknesses because improving shortcomings prevents failure. But Knucklepuck isn’t most businesses, and we don’t strive to meet the bare minimum. Why avoid failure and focus on weaknesses when we could capitalize on our team’s strengths to propel prosperity? 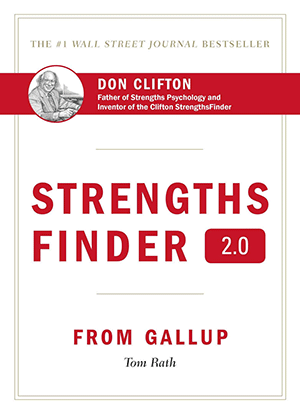 This unique perspective — that success begets success — is the defining principle behind the Clifton StrengthsFinder, a psychology-based assessment that identifies a person’s top five strengths out of a universal list of 34 traits. Each team member at Knucklepuck has taken the StrengthsFinder test. We use this common language to truly understand our teammates — who they are, why they behave as they do and what intrinsically motivates them. Armed with this knowledge, our leadership team can effectively leverage each person’s natural talents to compose winning project management strategies, assign tasks and drive success for our clients. And, unlike other personality tests, StrengthsFinder offers concrete explanations that anyone — even those who haven’t taken the assessment — can understand, making its benefits truly universal. Click or hover over each strength for a quick explanation.